Desert art is in the news this month with the approach of Desert X, the site specific event (February 25-April 30, 2017) that will overlap with the Coachella music festival. A sister event, Joshua Treenial, takes place March 31st through April 2nd in Joshua Tree. 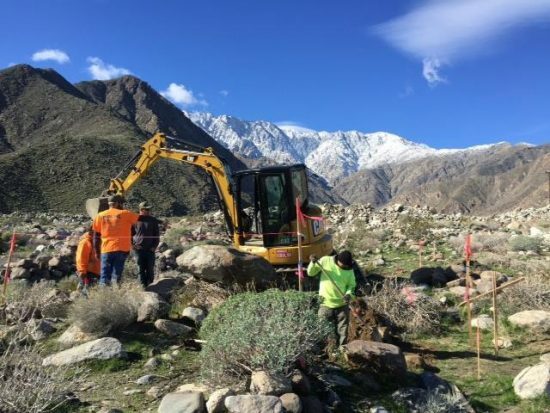 While the Smoketree painters connected with the land by camping and roaming on it for decades, many of the arriving artists are out-of-towners who don’t know Tahquitz from Tachevah. The first lesson: The desert isn’t empty. While outsiders may see the desert as vacant, empty or a blank canvas–as it is described in the Desert X curatorial statement–the guide says: “There is no such thing as a tabula rasa or blank canvas in the desert, or any ecosystem or place.” The Land Trust wants artists to know the desert abounds with incredibly diverse life. Before you install your quadraphonic sound system or mirrored columns, consider the microfungi, algae and lichens who were installed here before you. The hit of the Cathedral City historical exhibit at the City Hall gallery through February, 2017, is Margie St. Anthony’s replica of The Arch. 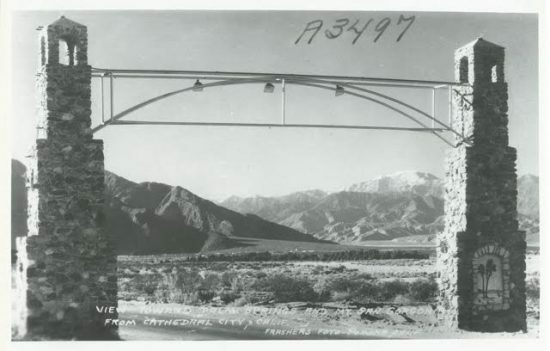 Built in 1927, the granite arch stood at Cathedral Canyon Drive back when Highway 111 was just a narrow lane through open desert. Sometime after WWII, the Arch (it makes a cameo in an Agnes Pelton painting) was bulldozed in the middle of the night and people have been missing it ever since. Margie St. Anthony–a mosaic artist who learned her trade while helping to construct the Cathedral City Fountain of Life–thought a new arch was in order. She stacked cardboard boxes and coated them with wire and polygon, then trekked to the wash in the summer heat and crawled on her hands and knees looking for the perfect flat-backed stones to complete the project. “It was like looking for mushrooms,” she says. After admiring Margie’s Arch, many visitors to the exhibit have asked: Why can’t the city rebuild the original arch? 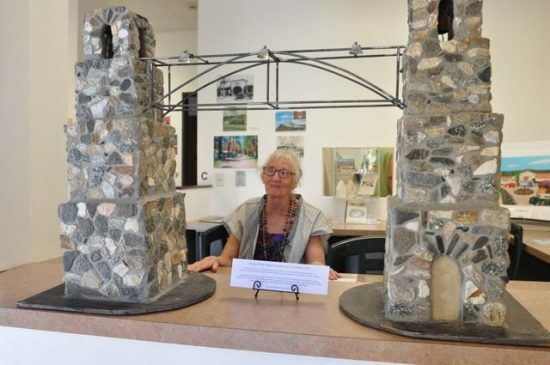 A few years ago, Margie and other members of the Cathedral City Historical Society did try to interest the City in building a replica of the arch. The effort stalled but Margie has sparked a new Rebuild the Arch movement. An Arch (not necessarily situated on busy Hwy 111) would be a fitting accompaniment to Cathedral City’s growing arts community. See Margie’s Arch through February at the City Hall gallery, along with historical photos and paintings–and a portrait of the young Agnes Pelton by Tim Townsley. Lou Armentrout–a former Columbus, Ohio schoolteacher once profiled here for his collection of desert art–has been living with the work of Gordon Coutts, Fred Penney, Carl Eytel and others on his walls so long that he’s absorbed some of their chops. “I taught myself painting by collecting,” he says. The exposure to the desert greats has yielded a collection of mysterious night paintings, many from an elevated vantage. 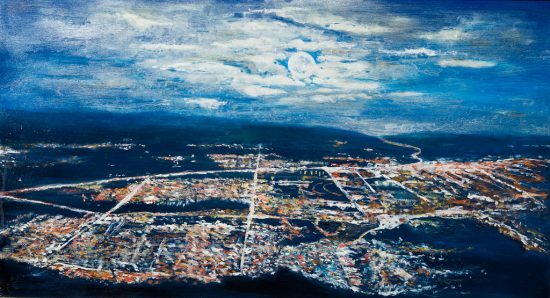 Nightscapes is on display at Brian Marki Fine Arts, on Arenas Road behind Lulu’s restaurant, through February, 2017. A docent at the Palm Springs Art Museum, Armentrout credits California both for his art and for his newly optimistic outlook. “California is golden in so many different ways,” he says. Armentrout hopes that each of his night scenes provides a peaceful respite for viewers. The home of an early La Quinta cove artist, Frances Nugent, is being preserved thanks to the current owners, real estate brokers John Miller and James Blanton. Originally called Rancho Tecolote, the adobe home was built in 1926 for artist and art teacher Nugent. 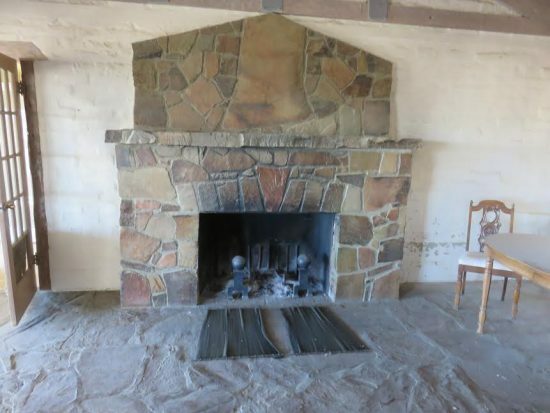 The property was run-down when the pair bought it; as restoration progressed the couple renamed it J & J Ranch and began offering the property to philanthropic groups for events. Frances Nugent was a graduate of UCLA and USC and taught for 40 years at San Fernando State College. She was a frequent lecturer on art around Southern California, but few of her own paintings have been found. Thanks to the efforts of Miller and Blanton, we’re hoping more will emerge on this very early artist resident of the La Quinta cove. More desert art history involving another artist named Frances–this time Frances Rich–is being preserved at the old Shumway Ranch on Highway 74 in Pinyon crest. 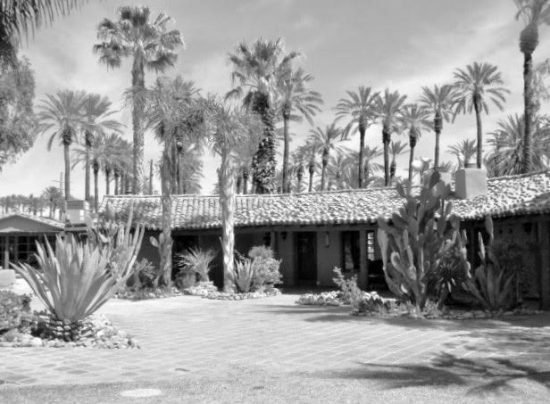 Recently purchased by the Coachella Valley Mountains Conservancy and other agencies, the ranch was home to writer Nina Paul Shumway who wrote Mountain of Discovery about her mountain home, as well as other entertaining accounts of desert life. In 1962, the ranch was purchased by actress Irene Rich and her daughter Frances Rich, a sculptor and WWII Naval reserve officer. Frances made busts of Katherine Hepburn (who visited the ranch) and Diego Rivera, among others. Frances used the main house, guest cabins and outbuildings as an elite arts colony, inviting her famous friends from Hollywood and New York. A visitor in 1969 said the talk at the table was as witty and intellectual as the Algonquin Round Table. Frances Rich died in Payson, Arizona in 2007 and left a cache of letters, which may yield more clues to the short-lived, high society Pinyon art colony. 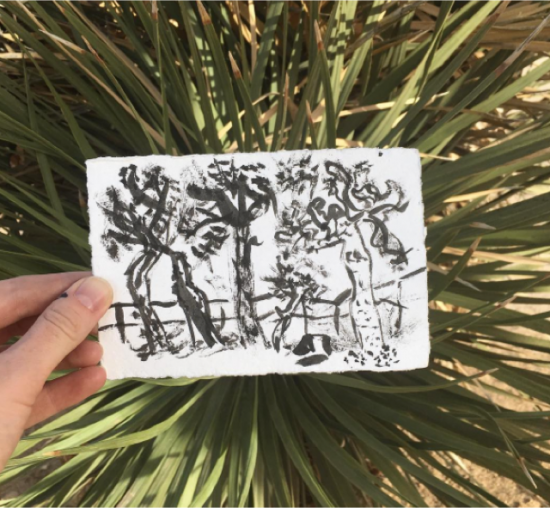 In the spirit of the freewheeling Smoketree painters, Brian Scott Campbell has started a desert drawing club in Joshua Tree. No experience is necessary and the only requirement is that you bring along a pencil and paper. A partner with Joshua Tree National Park’s Desert Institute, the club offers walks and scouting expeditions to locations in the high desert. Campbell offers a two-day Club Camp session via the Desert Institute on April 15-16, 2017. The class will seek inspiration from “the expressive, dynamic and linear Yucca brevifolia tree” (aka, the Joshua Tree) at the Lost Horse campground. Brian Scott Campbell is a an avant garde fellow who draws inspiration from the Italian futurists and Outsider artists, yet he knows his desert vocabulary (a Joshua Tree rock cluster is an inselberg) and instinctively employs Leave No Trace principles in his classes. Even though he’s a transplant from greener Ohio, he quickly learned the desert is not blank. Kathi Hilton, daughter of famed Smoketree painter John Hilton, returns to the Historical Society of Palm Desert for a second exhibit of paintings by herself and her father, March 17-20, 2017. Kathi will be in attendance all four days of the exhibit and is glad to talk with visitors about the early artists she and her father knew. A resident of Roosevelt, Utah, Kathi Hilton grew up at her father’s gem shop and art gallery at Valerie Jean corners in Thermal, and often visited the Desert Magazine Art Gallery (74-221 Hwy 111) in Palm Desert. Kathi and her father also spent time at the Living Desert, where John Hilton and other artists painted dioramas for wildlife exhibits. 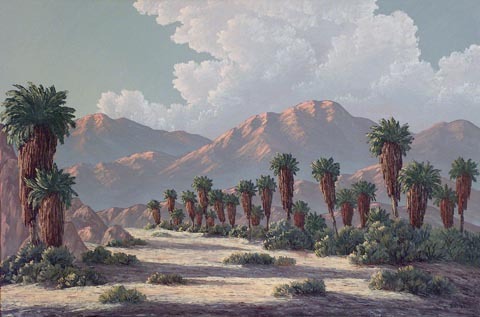 Kathi will be showing her paintings from the California and Utah deserts, along with a selection of her father’s landscapes–some painted at his former home in 29 Palms–as well as his sketches from a Baja trip that were reproduced in the book Hardly Any Fences. love! mojave desert land trust, dear ann, as our deserts disappear in front of u$. wonderful information, all of it! and none would have a place to be aired so profusely and inspiringly, without your californiadesertart! Another wonderful and informative issue! Happy to say that I have my own copy of Nina’s book “Mountain of Discovery”. Purchased it at the old Welwood Library in Palm Springs. Loved the photo of Margie and her beautiful arch.